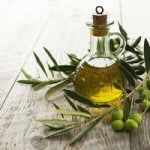 Ozonated Olive Oil is a powerful natural remedy for a variety of health concerns, especially those related to skin health. 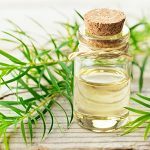 I wanted to share an overview of just exactly what this healing oil is, and how it works. Ozonated olive oil is made with high quality, organic, extra-virgin, cold pressed olive oil that is put through a process of "ozone injection", which is bubbling ozone into the liquid for an extended period of time. Many companies use a cheap corona discharge ozone generator that can lead to contamination. For purity and quality a cold plasma ozone generator should always be used. When searching for a high quality source of ozonated olive oil, ask the company if they are using a corona or cold plasma unit. Ozone is a reactive gas and is very hard to stabilize, but by passing it through the oil, contained within an ozone resistant container, the ozone gas begins to interact and stabilize within the oil. As it is continually processed, the ozone slowly begins to turn the liquid form of the oil into a off-white colored paste. 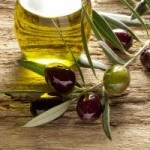 What is the difference between ozonated olive oil "liquid" and ozonated olive oil "paste"? The difference between the liquid oil and solid paste is the amount of saturated oxygen and ozone. Creating the paste version the process is much more extensive and the amount of oxygen and ozone saturation level is exponentially greater than any liquid oil product available. 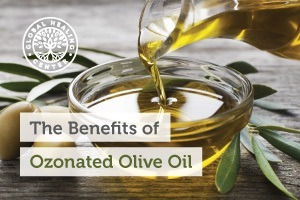 As an example, the ratio of O2/O3 in liquid ozonated olive oil formulas can only contain up to a percentage of roughly 10%, whereas ozonated olive oil paste contains up to 50% saturated oxygen/ozone, by volume. Also, the liquid does not have the long time release which ozonated olive oil paste does, which can last up to 12 hours or more when applied to the skin. Mike Adams. Review of Global Healing Center: Ozonated Skin Salve, Oxy-powder, Slimirex and Other Revolutionary Health Products. Natural News. 2008 June 17.